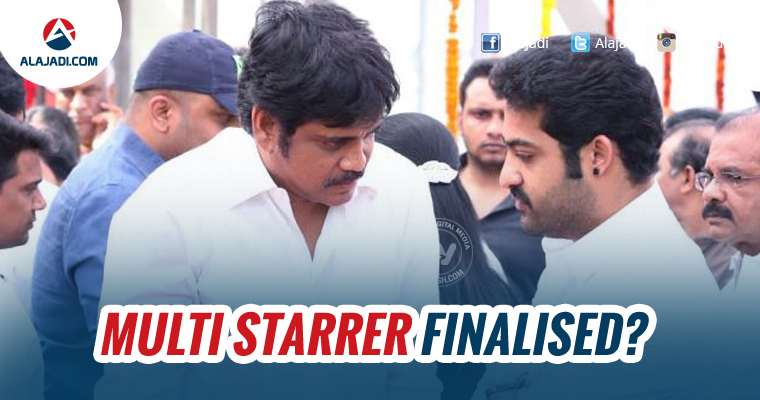 » Nagarjuna And Jr NTR Roped In For Multi Starrer? The trend of multi starrers has been trending in Tollywood these days. Though it is not a new thing in the industry. Fans of Nandamuri and Akkineni clan could not have hoped for a better Ugadi gift! After NTR and ANR, two star heroes (NTR Jr and Nagarjuna) from Tollywood’s cult families are all set to enthrall the fans. A couple of years ago, news has came out that Naga Chaitanya and Jr. N.T.R., were roped in for a multi starrer, but now an interesting buzz has been circulating in the industry that Nagarjuna and Jr. N.T.R., have signed for a film under the direction of Vamshi Paidipally. Well, the movie is happening. It is reliably learnt that both the superstars have given their nod for the script and are excited about acting together. The pre-production work would begin soon and the film is likely to go on floors around July. It is a well known fact that Jr. N.T.R., was supposed to act in the role of Karthi in Oopiri, directed by Vamshi Paidipally. But it didn’t happen due to various reasons. Now, it is heard that Vamshi has prepared a professor and student story and when narrated to both the actors, they immediately agreed to it. As now, the Jr NTR is busy with his forthcoming venture Jai Lava Kusa. On the other side, the actor A Nagarjuna is also busy with his new film Raju Gari Gadhi 2 in the direction of Ohmkar. Earlier, the actor Jr NTR and director Vamsi Paidipally together worked for family entertainer Brindavanam which successful at the box office.